Designed by the legendary Hermès creative director Henri d’Origny in 1978, the Arceau model is distinguished by its perfectly round case and stirrup-inspired asymmetrical lugs. At the recent SIHH 2019, Hermes revealed fresh makeovers that only made these classical timepieces more desirable. In a dreamlike dance of cosmic proportions, the Arceau L’heure de la lune simultaneously displays the moon phases as seen in the northern and southern hemispheres, aided by two mobile sub-dials that appear to float above the moons. 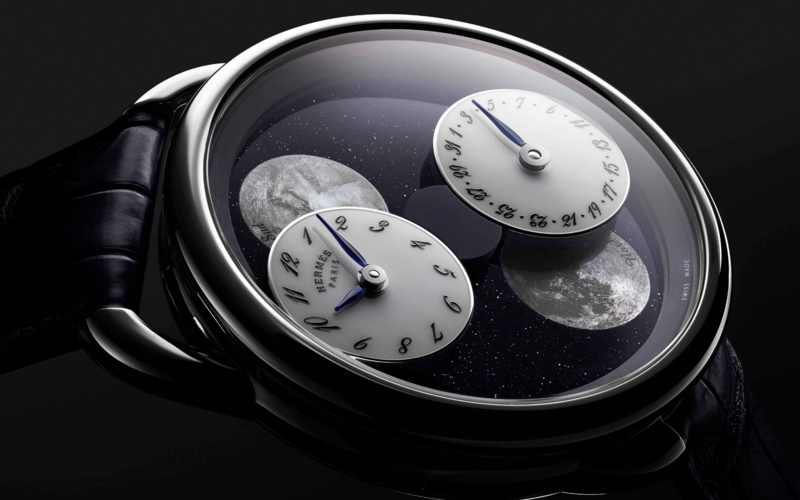 With one sub-dial indicating the hour and the minute and the other the date, they rotate around the dial in accordance to the lunar cycle, hiding and revealing the moon discs, and making one complete circle around the dial in 59 days. Made of mother-of-pearl, the northern hemisphere moon is deliberately positioned at ‘6’ while the southern hemisphere is at ‘12’. The moon at ‘12’ features a subtle hint of the Pegasus winged horse as envisioned by designer Dmitri Rybaltchenko. There are two dial options – aventurine and meteorite. Aventurine’s deep blue conjures the image of a clear night sky but the grey meteorite has the closest connection to the theme here. Limited to 100 pieces for each dial, the 43mm case is in white gold. The movement is an automatic incorporated with an exclusive patent-pending module that allows the mobile counters to move the way they do. Hermès has adapted Alice Shirley’s Awooooo wolf design originally created for a range of men’s scarves for A/W 2018 for this Arceau timepiece. The majestic creature, which appears to howl at the crescent moon, was recreated via meticulous enamel painting that also involved multiple firings at extremely high temperature. The details are astonishing – the wolf’s fur looks hauntingly realistic – and a testament to the incredible artisanal talents at the French luxury fashion house. Limited to 8 pieces, the Arceau Awooooo watch is powered by an automatic movement with 50-hour power reserve. Case is white gold measuring 41mm in diameter while the strap is matt alligator leather with white gold pin buckle. Watches & Jewellery 5 Cool Features That Make The Louis Vuitton Tambour Horizon Watch Totally Awesome!